eiforumrf@gmail.com. Number of places is limited. 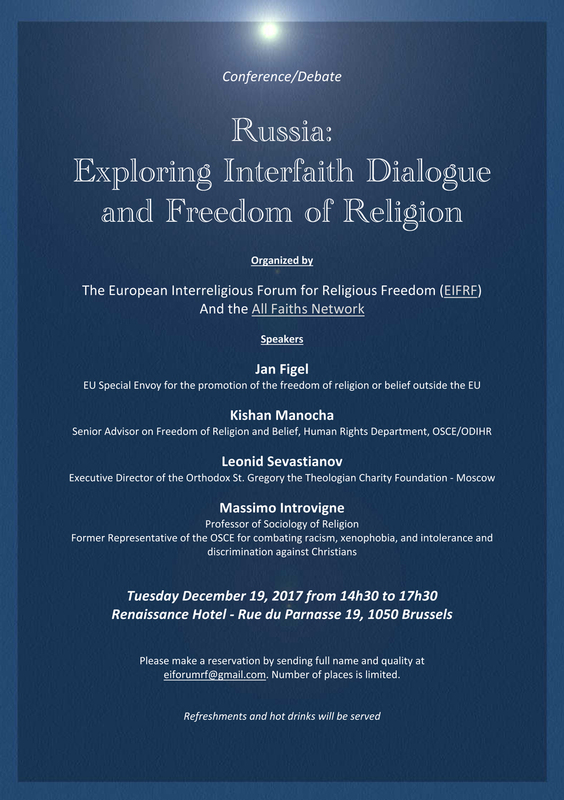 The conference, organized by EIFRF and the All Faiths Network (member of the Inter Faith Network for UK – https://www.interfaith.org.uk ) will be held Tuesday December 19, 2017 at 14h30, Renaissance Hotel (Mariott) – Rue du Parnasse 19, 1050 Brussels, at 2mn walk from the European Parliament. To reserve your place please contact eiforumrf@gmail.com. Russia is a vast country with a rich religious and cultural history along with a wide range of faiths. It has been subject to many changes, both turbulent and invigorating, over the last century which have coalesced to bring about today’s modern state. Religion should be able to stand above all this. It is, after all, about the spiritual in Man – about greater aspirations than just worldly gain and religion has a moral role to play in enhancing the culture for the greatest good of all. There is, understandably, a certain concern when small, new or old versions of different religions enter the cultural landscape that were not present before. However, what we have also advanced over the last century are human rights standards which have developed considerably in order to protect the rights of individuals and to respect their choices. 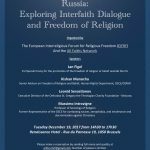 Whilst there has also been some international criticism of certain decisions made within Russia concerning religious status it is clear that the vast majority of Russian people simply wish to live in peace and comfort whilst being able to follow their own religious choices. This conference has the purpose of developing dialogue between all religions great and small, to develop, educate about and respect human rights standards and to drive forward a responsible approach to interfaith and religion-government relations. The conference will be followed by live debate.